Hello, friends, and welcome to Episode number 12 of The Greg Amundson Show. Thank you so much for joining me today. My friends, I am very excited to share with you today’s message which is called Meditation on the Warrior’s Path. I remember when I was in first grade at Presentation Elementary School in Stockton, California. This school was associated with Presentation Catholic Church and was presided over by a senior priest named Father Michael Kelly. From grades one through six, my teachers were nuns. This was a very, very traditionally one Catholic school. We began every single morning with prayer, both silent prayer and prayer as a class that was led by either the nun who was teaching us, or on Fridays, we would have a special visit from Father Michael Kelly. On one particular morning, after we prayed the Lord’s Prayer with Father Michael Kelly, he challenged us to repeat in our mind ten times the word “amen.” The challenge was repeating the word amen ten times perfectly clearly in our mind and to count every repetition of the word amen. In the event we were trying to think the word amen, yet another thought entered our mind, we simply forgave ourselves for not being able to reach ten repetitions of amen, and then went back to the beginning. This process would repeat itself over and over until in our young minds we were able to count ten repetitions of the word amen. Well, although Father Michael Kelly did not refer to this particular practice as meditation, that was my first introduction to the power of meditation. It’s amazing what Father Michael Kelly instilled in me that day. The ability to focus the mind on one particular word is what is known in the meditation practices as transcendental meditation or mantra meditation in which we focus the mind on one word or one particular sound that may or may not have any meaning whatsoever. We simply repeat the sound or the word over and over and over, and that word or sound acts like an anchor that drops through our consciousness, through our thinking mind into the very depths of our soul. It allows the mind to still. It allows the mind to settle. It allows the mind to become clear. And, my friends, the real joy to be had in meditation is that once the mind becomes still, then we can experience the presence and the peace of God. I just love that story because how often do we find ourselves assuming that it is the next accolade, it is the next physical accomplishment, it is the next object of our desire that will lead to our happiness, that will help us to feel like we’ve got it, now we’re ready. The physical pursuit within the world is so tempting. Yet, time and time again, the wisdom tradition from the Bible to the martial arts teaches us it is in fact our ability to be still both in our body and in our mind that is the pathway, that is the gate to all happiness, to all joy. This is, in fact, why Jesus Christ warned his disciples about the illusion and the temptation of looking over here or looking over there, referring to the tendency of the mind to project itself through the senses onto material objects of our desire. Christ said, “Behold, the kingdom of God is within you.” And it is our practice of meditation that allows us to come into very real contact with the kingdom of God, with the very presence of God. My friends, I introduce basic meditation in my new book Firebreather Fitness: Work Your Body, Mind, and Spirit into the Best Shape of Your Life. And I thought it would be fantastic to turn to this book and the particular chapter that I wrote on meditation. The feedback that I have received from Firebreather Fitness has been fantastic. It’s been wonderful. And the particular section that people find most captivating and most helpful on their path is the section on spirit. And of course within the section on spirit, we find the specific chapter on meditation. We pick up on page 179 which is titled Building Strength and Resilience Through the Practice of Meditation. One of the best ways to experience the benefits of meditation is to become aware of our energy and to witness the quality of each breath. We tend to think of energy production in the external sense of the word. However, when you become still and silent during meditation, an entirely new world opens up right before you. You become more aware and sensitive to how closely thoughts and emotions are linked. During the course of our day, we tend to focus on the external objects passing through our field of vision. This draws our energy out into the world. Unfortunately, when focused on the outside world, the mind tends to resist change, working instead to control our external circumstances, forgetting that the external world is outside of our ability to control. Meditation helps to reverse this tendency of the mind to attach to the external world and to reverse the flow of our life force from the outside to the inside. During an advanced meditation course, master yoga teacher Rolf Gates offered me this visual representation of the effects of meditation. Rolf said, “Greg, when you sit down, close your eyes and become still. The sand begins to settle and the water becomes clear.” In other words, non-action and non-activity allow us to settle down, and in this settled state our minds become clear. But it is important to note that meditation is not necessarily the absence of thoughts. Meditation is, plainly put, the returning of your attention to the meditation. Let me repeat that one more time. Meditation is, plainly put, the returning of your attention to the meditation. For example, you may choose to focus on your breathing. In this manner, you sit down, you close your eyes and become still. You begin to cultivate your witnessing self and watch yourself breathe. You essentially witness yourself take a deep breath in, you witness the moment of retained breath, then you witness yourself exhale, and then witness the suspended breath. In the moments that you are absolutely one with your breathing, you are experiencing meditation, and a deep sense of peace will be your natural state. Now, my friends, sometimes that is easier said than done because the tendency for the mind is the following: You take a deep breath in then think, “Oh, man, did I lock my car?” The mind jumps away from the intended focus of meditation. However, rather than judging this experience as negative your task is to simply take notice and gently return the awareness back to the breath. In doing this you resist the temptation to judge yourself negatively with negative self-talk or with criticism. You simply return to the work, you return to the practice, you return to the meditation. Along with the felt experience of watching my breath I employ another meditation technique frequently, which is the repeating of a mantra within my mind. The mantra meditation is wonderful because it allows the mind to enjoy its natural state of activity in a focused manner. For example, the tendency of the mind is to jump from one thought to thought, from one idea to one idea, from one memory to another memory. By introducing a mantra, the mind settles around this word or sound, repeating it over and over until thinking becomes more subtle. In this meditation, it is common to experience internal silence between the thoughts or what Deepak Chopra refers to as slipping into the gap between your thoughts. The great wisdom teachers instruct that the space between thinking is the universal space of pure awareness. You directly experience the universal mind, pure potentiality and the unlimited nature of your spirit. In yoga it is very common to use the mantra of the sound “ohm,” and in my early childhood as I already mentioned in the Catholic Church with Father Michael Kelly, he taught me to repeat the word “amen.” Isn’t that wonderful, my friends? That’s from my book Firebreather Fitness. The reason that I recommend and endorse meditation, my friends, is because it works. It has worked tremendously in my life. When I look to my mentors, what I always look for within my circle of mentors is what are the universal themes, what are the universal strategies, what are the universal recommendations that my mentors are making to me. And, my friends, what I have found is that every single one of the great mentors in my life ranging from my father to my early childhood experience with Father Michael Kelly to more recent mentorship with Rolf Gates — Rolf Gates, by the way, if you have not yet tuned into previous episodes, had an amazing career as a US Army Ranger. He served as a captain in a phenomenal infantry unit, ultimately left the Army to pursue the path of yoga. Rolf Gates is a warrior yogi. Rolf Gates was my second yoga instructor following Mark Divine. And as I’m sure you know, because I speak of him so often, Mark Divine was a US Navy SEAL, a SEAL commander. So these two great warriors taught me the power of none other than becoming still. The reason that I share the story of the young student approaching his master teacher hoping and thinking that “Oh, I know. There must be one more physical pursuit. There’s got to be one more physical technique that I can learn. And when I learn it I will be ready.” And what did the master say to the student? “Be still.” He essentially said, “Meditate.” When you can sit in such a way that not the roughest ruffian would dare make onset to your presence then you are ready. You see, what I understand now within that story is the teacher was instructing the student to so cultivate the quality of his mind, that his mind was at peace, his mind was clear. You see, our mind takes on the quality of a great megaphone. We project into the world everything that we think within the temple of our mind. By the law of attraction, we therefore attract into our reality every thought that we entertain. So as a martial artist, if we can discipline our mind to be still, to be at peace, we create peace in our environment. This is why in The Art of War, the author describes the power of becoming still in your mind and he writes that to win a thousand battles without fighting is the essence of the true warrior. Win first in your mind and then walk onto the field of battle, for only then can you always prevail. My friends, that is meditation. Here’s what’s really fascinating, my friends. One of the stories that I share very, very often about one of my dear friends and long-time mentors Coach Greg Glassman, the founder of CrossFit, is this: Within just a few months of training with Coach, I wanted to win every single workout. Winning a workout was equivalent to living or dying on the street. That may sound a little bit extreme. It probably was. However, at that time in my life I was a brand-new deputy sheriff, and to me, winning in the gym was giving me the confidence to win on the street. I could simply not accept in the gym anything other than first place. And what’s amazing is at that time all I could say was, “Well, I’m eating.” Yet, I really had no awareness. I had no clue as to the quality or the quantity of food that I was putting into my body. And Coach helped me. He basically took sympathy, he felt bad for me, and he created CliffsNotes of the book Enter the Zone. He broke it down for me, he wrote for me a menu, and I really haven’t a changed that menu too much to this day. You see, Coach was the first person that inspired me to understand the power of physical nutrition. Now, the reason I emphasize the word physical nutrition is that there is another type of nutrition that is equally important, and that his mental nutrition. 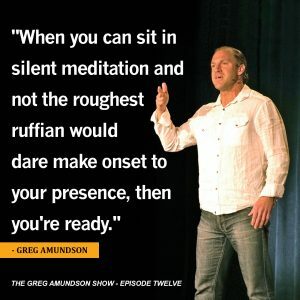 One of the stories I’ve shared before on The Greg Amundson Show I think is fitting to share again because it is about the power of meditation and nutrition and how closely the thoughts that we think and the stillness between our thoughts allow us to ultimately influence the quality of our thoughts. Jesus Christ was one day accused of breaking the sacred law because, well, he did not wash his hands before consuming food. And Christ said, “It’s not what goes into your mouth that defiles you, it’s what comes out of your mouth.” Isn’t that amazing, my friends? It’s the quality of our spoken word, and we know that what affects the quality of our spoken word is the quality of our thinking. And back to meditation, the only way that we can ultimately cultivate a pure mind is by allowing our mind to rest in the presence of God. In the Bible it says, “Create in me a clean heart, oh, God, and put a new and right spirit within me.” Again, when we remember that the word heart means subconscious mind, what this is essentially saying is “God, Create in me a clean mind. Cleanse my mind, God, of all unrighteousness.” Seek first the kingdom of God and his righteousness and everything else will be provided. Righteousness, my friends, simply means right thinking, the ability to conduct within the temple of our mind, a disciplined way of thinking, a clean temple. In the Bible it says, “As for me and my house, we will serve the Lord.” Well, my friends, in the Bible the word house is many times used as a metaphor for our mind, the house of our mind. It is essentially saying as for me and as for you, within our mind we will serve the Lord, we will direct our thinking onto God, onto the presence of God and his son Jesus Christ. And now on to the devotion. One of the great lessons Christ taught was to love your enemies. However, what do you do when the enemy you face is your own negative thinking? Hidden in the rich metaphor of the book of Luke is the secret to this enduring question. You must discipline your mind to think of love, forgiveness and encouragement. In the same manner that a wise carpenter uses a good nail to drive out a bad nail, you can use a positive thought to replace a negative thought. Do not wrestle with the enemies of discouragement, anxiety, fear, uncertainty or despair. Instead, call upon the presence of God in you and elicit the great allies of hope, encouragement, faith and love. Isn’t that a powerful devotional, my friends? This, again, is the power of meditation. What we develop in meditation is the ability of our great witness to witness the quality of our thinking. Isn’t that a great story? And I love that story because using nature, using the creation of God all around us enables us to really gain perspective on the power of meditation. Using that story, the great witness that I often describe, this is the same great witness that Mark Divine describes, the great witness in that story is the sky. The thoughts are the clouds passing beneath the awareness of the sky, and what we discover through the practice of meditation is that thoughts come and thoughts go, just like weather comes and goes, just like clouds come and go, yet, the sky remains the same. And for those of us on the path of the warrior, what we discover during meditation is that God remains the same. This is why the Bible says God is the same yesterday, today and forever more. And when our mind settles on the presence of God, we can become still on the rock of his foundation. In that stillness we then cultivate the ability to watch or witness our thoughts pass by. We discipline ourselves not to attach to the thought. The only way a thought gains power is by our attachment to it or our aversion from it. In and of itself, a thought has no power. We simply breathe life into it when we focus on it. Those of you that have already started on the path of meditation, I give you the advice that one of my drill sergeants gave me in US Army basic combat training. He said, “Stay the course.” Stay the course. Commit to your practice. The practice of meditation, just like the practice of breathwork, just like the practice of gaining greater intimacy with the presence of God, needs to be a daily discipline, my friends. Meditate every day, even if it’s only for a few moments. Remember Dan Brule, one of the great modern-day warrior yogis, a renowned breath master. He told me that a breath practice can be as simple as taking one mindful breath a day. And what we find is that meditation and breathwork are very, very closely linked. They are two sides of the same coin, because as we take a deep breath in and as we witness that breath, we are engaging in the practice of meditation. Well, my friends, I just want to take a moment to pray with you. God, I just pray that wherever this person is who is listening to my words in this moment, God, I pray that you would bless them. I pray, God, that you would bless them with peace. I pray, God, that you would bless them with clarity of mind. I pray that you would renew the quality of their thinking. God, I pray that you would put a new and right spirit within them. God, I pray that you would create a clean heart within them. And God, I pray that you would keep them safe and healthy as they continue to embark on the warrior’s path. Well, my friends, thank you for listening to the episode today, and I will talk to you again soon back here on our next episode together of The Greg Amundson Show. Take care.